Special discount! We're waiving online ticketing surcharges through Labor Day only. Get the most out of summer and explore all the fun stuff the Aquarium has to offer. Buy your tickets online today. The marine mammal trainers are always looking for new ways to engage with our seals and sea lions. 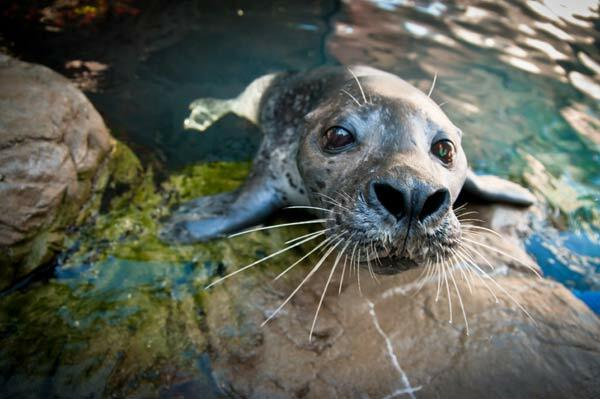 This summer, Marie is connecting with one of the harbor seals in his element—underwater! Look for Marie underwater during one of the many training session that happen on our Front Plaza. And check out a short clip of an underwater kiss over on the Trainers Blog right now! Get the sea turtle rescue experience in our newest exhibit! Have you seen our popular Sea Turtle Hospital yet? What are you waiting for?! 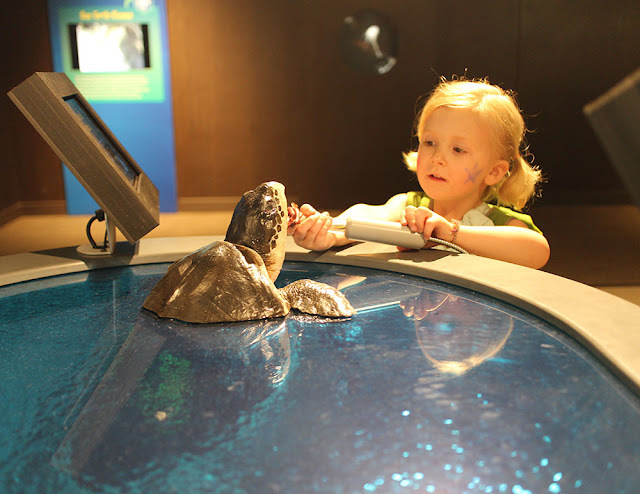 This summer our newest exhibit has been captivating visitors of all ages with a special sea turtle rescue experience. Learn about our rescue team's epic efforts during this past record stranding season. Then give turtle rescue a try yourself with some of our charming replica sea turtles—fun for all ages! 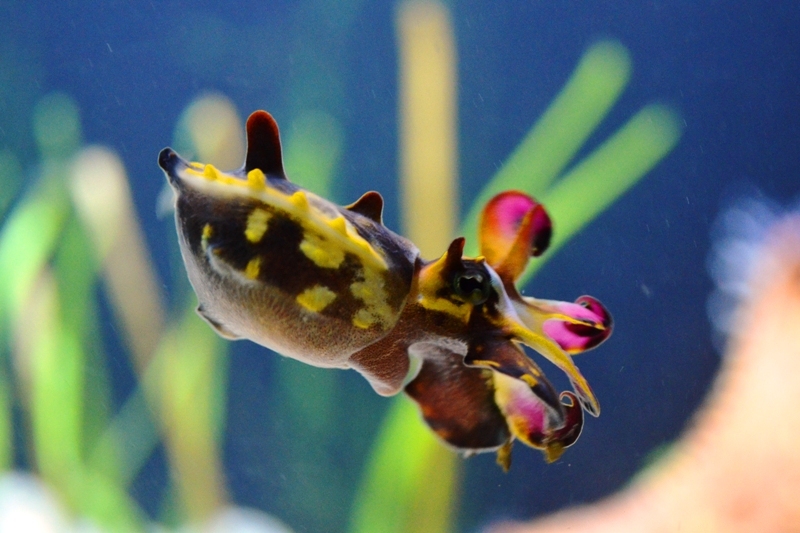 The cuttlefish exhibit just got a lot more colorful. 10 flamboyant cuttles just went on exhibit! This species is native to the western Pacific (Japan) but these were hatched our friends at Monterey Bay Aquarium. They can change colors like their cousins the octopus, have toxic skin (so the aquarists have to be careful not to touch!) and can hypnotize their prey. Whaaaaat? This you have to see. Don't miss the the contraption in the corner of the exhibit, too. It's an incubator of sorts for the eggs that our pharaoh cuttlefish recently laid. The cuttlefish actually deposited the eggs on the coral structure in the exhibit, but our aquarists moved the eggs to the aerated bottle to protect them from hungry sea stars. The hope is that these cuttlefish will hatch out and add to the exhibit someday. Come see them grow! Meet the new kids on the rocks! There are a few new feathers springing around the islands of the Penguin Exhibit right now. Several chicks that hatched earlier this summer are all grown up and have joined the colony. Click over to the Penguin Blog to meet the new guys. There are some cute baby pictures that you do not want to miss. 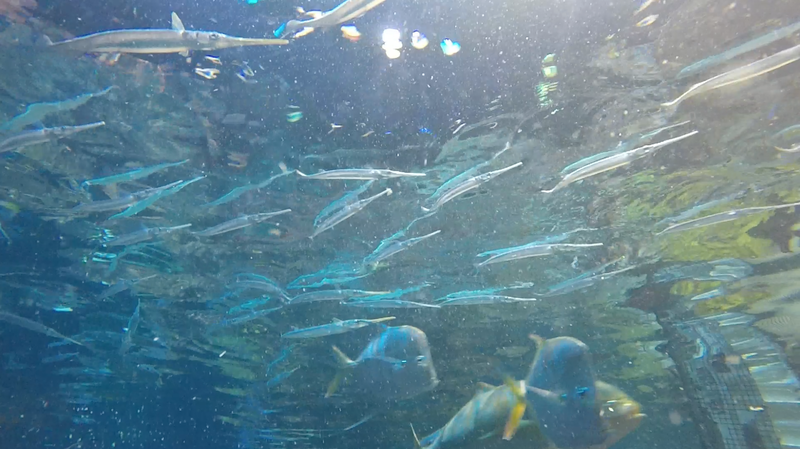 The schooling needlefish are some of the new fish you can see in the Giant Ocean Tank. The divers just added dozens of new fish to the Giant Ocean Tank, including this haystack of needlefish. Climb to the top of the GOT to look down on these guys skimming just beneath the surface of the water. The Divers Blog also features a short underwater clip of these fish on the move! Of course, no Aquarium adventure is complete without a visit to the IMAX theatre, with three larger-than-life underwater movies. Don't forget to swing by the Gift Shop to pick up some swag to help remember your visit (because there's no such thing as too much penguin paraphernalia). And after all that, you'll want to saunter into our waterfront restaurant The Reef for some tasty snacks and drinks for the whole family.